To make the citrus cured salmon, place the salt, sugar, lemon rind, orange rind, lime rind, orange juice and 1 teaspoon of pepper in a medium bowl and mix to combine. Place 2 sheets of plastic wrap on a clean work surface, overlapping slightly to make a sheet long enough to completely cover the salmon. Spread with half of the salt mixture and top with the salmon, skin-side down. Cover with the remaining salt mixture, wrap tightly in the plastic wrap and place in a deep-sided oven tray. Top with a smaller oven tray, weigh down with heavy objects and refrigerate for 48 hours, turning the salmon every 12 hours. Remove the salmon from the plastic wrap and wipe with paper towel to completely remove the salt mixture. Using a sharp knife, thinly slice the skin from the salmon. While the salmon is curing, place the plain flour, buckwheat flour, salt and yeast in a medium bowl and stir to combine. Make a well in the centre and add the milk, buttermilk and egg yolk and whisk to combine. Cover with plastic wrap and set aside in a warm place for 30 minutes or until bubbles start to appear on the surface. Place the eggwhite in a small bowl and whisk until soft peaks form. Add to the flour mixture and mix well to combine. Heat a large lightly greased, non-stick frying pan over medium heat. Place tablespoonfuls of the mixture in the pan and cook for 1–2 minutes or until bubbles start to appear on the surface. Turn and cook for 1–2 minutes or until golden. Set aside to cool. 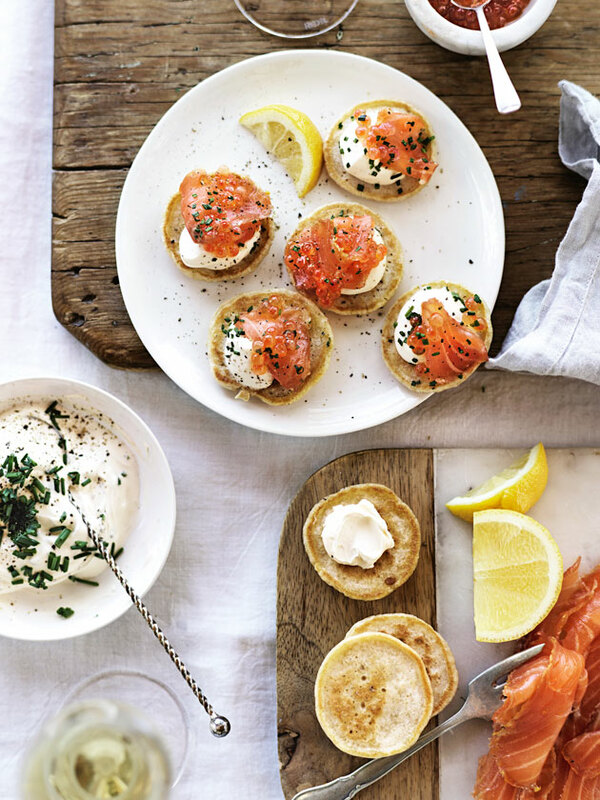 Top the blinis with the sour cream, salmon, roe, chives and pepper to serve. Serves 6. Wine note: These deliciously rich flavours pair perfectly with the complexity of the Cloudy Bay Pelorus, NV.